Thalheimer Mortuary refrigerators and freezers cell type / single door model LKZ CC / LKZT CC are produced with emphasis on modern technology, economic efficiency and German preciseness. Through continuous improvements in the manufacturing process, including the development and utilization of environmentally friendly, state of the art technologies, we have been able to significantly increase the refrigeration performance and efficiency of our products while dramatically reducing energy consumption. are completely made of stainless steel. Cooling system: Can be mounted on the top panel, alongside the refrigerator or remotely (Split unit), the compressor is hermetically sealed, air-ventilated, vibration-free. The refrigerant used are of different types R134a or R404a or R507 CFC-free. Automatic time controlled defrosting, safety thermostat, microprocessor controller. 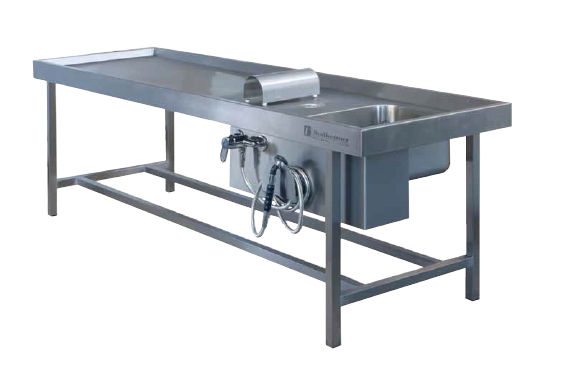 As per customer’s requirement Thalheimer can design and produce Mortuary refrigeration and freezing systems with double cooling system that can be mounted on top, on side, or remotely in a machine room or anywhere. The cooling system includes auto switchover. 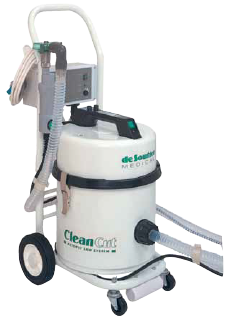 The calculation of cooling capacity for each unit is designed to perform at a maximum ambient temperature. Provide complete back up protection for the cooling system of the mortuary refrigerator or freezer. This cooling system designed to contain two complete refrigeration units with duplicate condensing units and evaporators (fan coil). 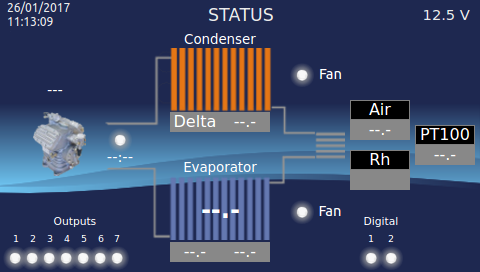 Each of these systems is enough to cool the cooling chamber independently. So if one fails for any reason the other takes over automatically to maintain the required internal temperature The system has a timer that alternates the two refrigerator system, running over for a pre-set period of time, enhancing the life of the system. (i.e. operational and resting on regular basis). The evaporators are of high-powerful type installed in the interior of the mortuary refrigerator, switched off / on from the control panel or (optional) if the doors are opened / closed (activated with a door-contact switch). panel is possible, interior evaporation of condensation water is also possible. Alarm system: Visual and acoustic signaling at temperature instability, voltage 230 V or batteries, can be connected to remote alarm control through potential-free terminal. In case of double cooling system, each unit includes central alarm system, microprocessor-controlled, with optical and acoustical signals. The front side of the refrigerator is supplied with control panel which contains digital indication displays with 0.1 C resolution for internal temperature, audio and visual alarm for high temperature, temperature regulator, temperature recorder with (Optional) paper discs and internal light switch. The control system includes high-low pressure cut out, oil pressure cut out units, operation timers, defrost timers, and all other major elements. Electrical system: The cooling systems produced for connection to power supply of 230/240 or 380 V, 50-60 Hz-1 ph-3ph. The supply includes power plugs and 3 m long power connecting cords, for connection to local power sockets. 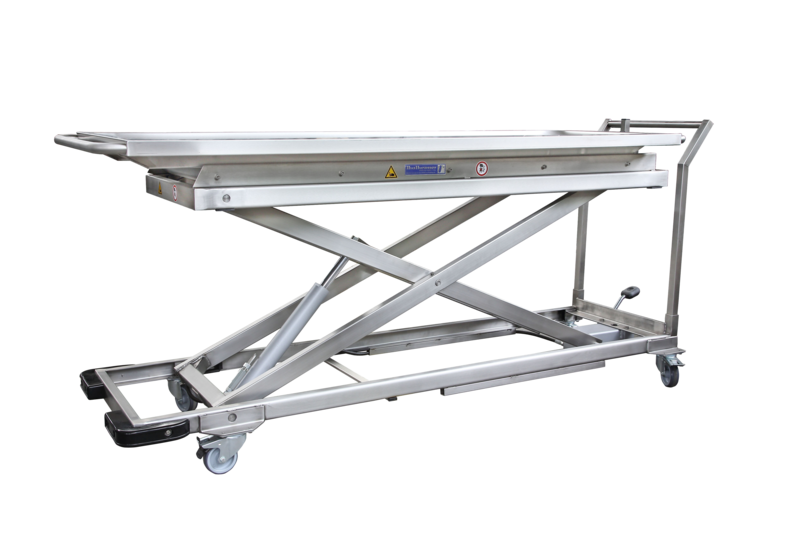 Capacity: 21 bodies, for the storage of normal size corpses, on 3 levels, compatible in its dimensions to the body lifter. Internal lighting: Internal lighting, water proof, to be switched on at the temperature controller. 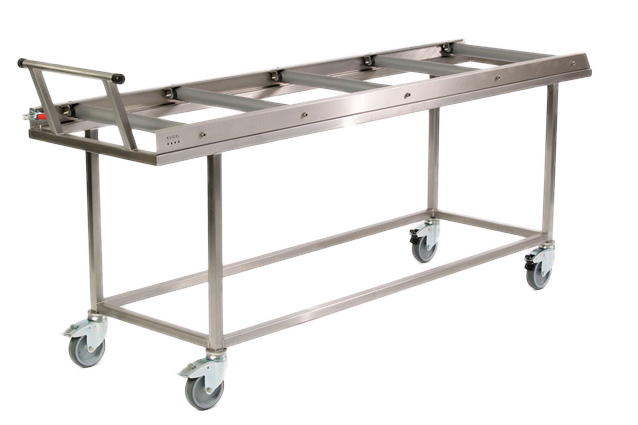 Roller tracks: Per body one roller track with 5 rolls with maintenance-free ball bearings for an easy move of the tray in and out, at the rear side with an additional stop-roll which prevents shocks against the back wall. The rolls are made of corrosion resistant material, with special coating material and have maintenance-free ball bearings, the rails are completely made of stainless steel. Refrigeration system: Single/Double cooling system (top mounted) each unit is capable to maintain the required internal temperature at the specified ambient conditions. The compressors are semi hermetic, air cooled type. Assembly: sandwich panels with groove and tongue assembled together with foamed-in eccentric hooks, guarantee a high stability and tightness. the local network or internet and all alarms and functions of the unit can be controlled through remotely. 2) Low power supply for display in the range between 12-24 Vdc. 4) Display can be installed at any place within a range of 200 M distance from the mortuary refrigerator. 5) SD card or micro SD Card data storage for long life data storage for each refrigeration unit. 1) Linux embedded operating system based. 2) Possibility to connect the display to the BMS with support Modbus TCP protocol. 5) CSMS controlled remotely from the central administration office for data entry, and the real-time situation. 6) Continuous graph of cold room Temp and set point. With Temp digital indication. 2) Remote relay alarm system. The concept of the Automatic Electromechanical Door Locking System (AEDL SYSTEM) is to keep away unauthorized people from accessing the Mortuary refrigerator without permission. There will be no manual keys and locks. All door opening management can be done through the touch panel display control system Della9 with RFID, through which you can put your access code (password) and select the door to be opened. 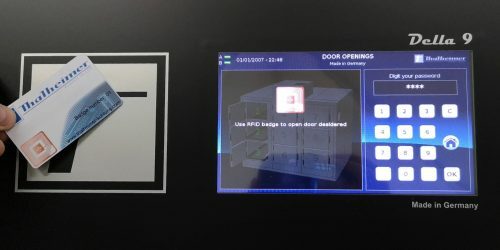 The system will require a second security level, (RFID badge) to enables the operator getting the door opened. 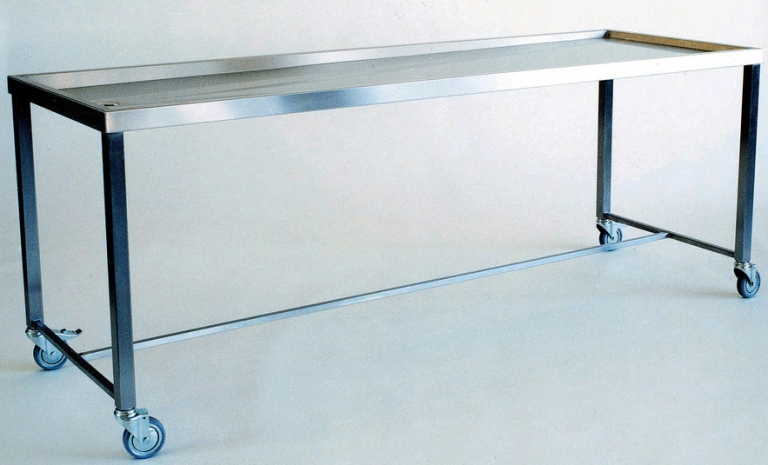 The door will be released from its locking status automatically; after loading the mortuary with the body tray, the operator needs to close the door. uses Electromechanical locking mechanism with battery operation. The mechanical holding force for each lock is 200 KG. The access codes (Passwords) can be programmed with different codes as much as required. All actions, door open, door close, opening duration etc. 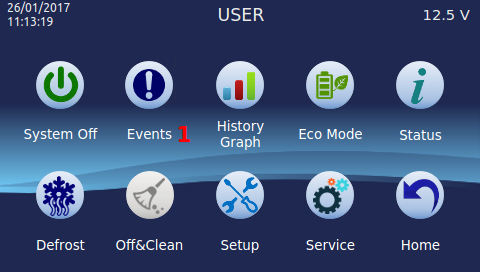 are stored in the memory of the control system and can be shown in the reporting system. You can also find out if the actual door status (opened or closed) directly on the display controller by clicking the door status to find directly on the Mortuary mapping.